Last night in Newark, Villanova blew a three four-point lead with 16.3 seconds left and lost to Seton Hall by one. The defeat dropped the Wildcats to 18-11 overall, 9-7 in the Big East. It also solidified their status as the country's most baffling college basketball team. Back in November, 'Nova lost at home on campus to Columbia—Columbia—by 18 points. They then split their four games against the Philadelphia Big 5, including a loss to La Salle for the first time in 11 years. After opening Big East play with two victories, the Wildcats lost three in a row heading into a week in which they hosted then-No. 5 Louisville and then-No. 3 Syracuse at Philly's Whatever Bank Name Center. 'Nova won both games. Those wins were a huge boost to the Wildcats' profile, but they were followed immediately by losses to Notre Dame and Providence—and it was Providence's second win against 'Nova this season. 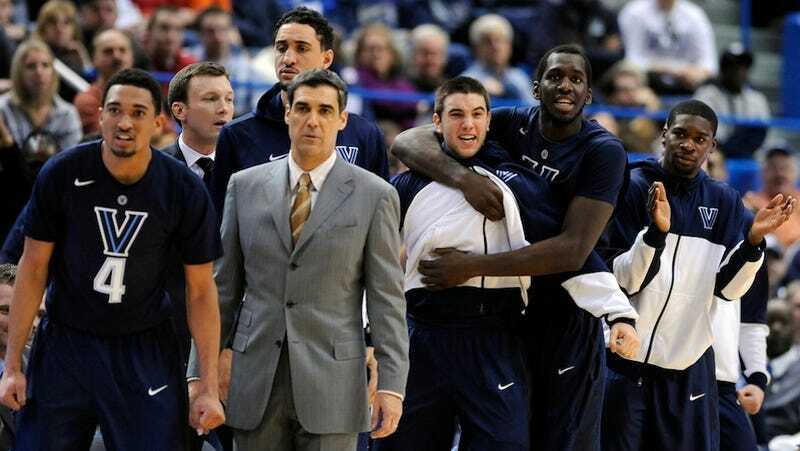 After two wins against Big East bottom-feeders DePaul and South Florida, 'Nova went to Cincinnati and lost by 18. The Bearcats did spend most of the season ranked in the Top 25, but that win against 'Nova was their lone victory in their last six games. From there, 'Nova kick-started a three-game winning streak that included wins at UConn and at home against Marquette, the team that's just one-half game out of first place in the Big East. Then there was last night's loss up the turnpike in North Jersey. Seton Hall had been 2-13 in the conference. So with less than three weeks to go until Selection Sunday, where does this scattershot season leave Villanova? Both CBS Sports's Jerry Palm and ESPN's Joe Lunardi still have the Wildcats making the NCAA tournament, largely on the strength of those wins against Louisville, Syracuse, and Marquette. But that could change. 'Nova closes out the regular season at Pitt—where they've lost nine in a row and haven't won in 17 years—and at home in South Philly against Georgetown, which is riding a nine-game winning streak and is now in first place in the Big East. A pair of victories figures to make the Wildcats a lock for the NCAAs. With two losses, things are much less certain. A split would only make their status that much more difficult to pin down. And then comes the Big East tournament.